Even if swimming isn’t your thing, it’s impossible to ignore the incredible athletic prodigy that is Michael Phelps. Find out more about his training, diet and motivation! Few people know how it feels to stand atop an Olympic podium, but for Michael Phelps, the podium is like a vacation home. His speedy combination of genetics, will power and skill have resulted in 14 gold medals. The world will watch the 2012 London Games to see if Michael Phelps still has what it takes reign as the world's greatest swimmer. 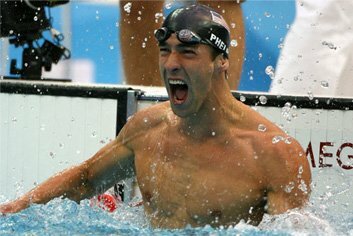 Regardless, Phelps will be remembered as the greatest American Olympian. It takes more than a few laps in the pool to achieve his level of greatness. Phelps' journey from a child learning to swim to arguably the most dominant Olympic athlete ever has been replete with records, ribbons and the repeating glint of gold. He currently holds 7 world records, 14 Olympic gold medals (6 in Athens 2004 and 8 in Beijing 2008), 2 Olympic bronze medals (Athens), the-all time record for most gold medals in individual events, and myriad other swimming awards and medals, including the 6-time World Swimmer of the Year. Still, Phelps' notorious rap sheet is far from being complete. This summer Phelps plans to add more metal his already impressive list of achievements. His rivalry with fellow American swimmer Ryan Lochte is sure to add some drama to the swimming lanes. Phelps' skill in the pool has a foundation in his physique. He stands 6-foot-4 but his wingspan is 6-foot-7, which makes the length of his stroke a huge advantage in the pool. His legs are relatively shorter than his upper body, resulting in less resistance/drag in the water. When he's competing, Phelps keeps his weight down - never more than 200 pounds - to ensure the least amount of drag. His size 14, double-jointed feet move like flippers, which help power him through the water. Even though he seems to be genetically engineered for the water, Phelps matches his genetics with an incredible work ethic and training regimen. He and his coach Bob Bowman have a strict and disciplined routine; a must-have for anyone who wants that prestigious spot on the podium. He trains in the pool six days per week and circuit trains with weights three times per week. He doesn't lift super heavy because extra bulk wouldn't help him. He wants to keep his body light and lean. He also wants to maintain that pinnacle of muscular endurance, so high reps and circuit-style training work best for his goals. He continually changes the exercises and their order often so his body can't adapt to a set routine. Phelps' favorite exercises are those that involve his bodyweight, like dips and pull-ups. 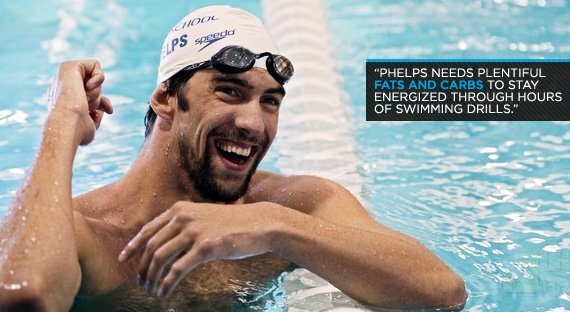 When he's training, Phelps's daily food intake could be anywhere from 8,000-to-10,000 calories per day! PER DAY! 3 fried egg sandwiches with low fat cheese, lettuce, tomato, mayonnaise, and fried onions. That is staggering! Obviously he doesn't eat the same thing every single day, but he does eat way more food than normal people (and way, way more food than anyone preparing for a bodybuilding or figure competition). His daily menu also includes one pound (yep, really) of pasta, 1,000 calories worth of energy drinks, and an entire pizza. 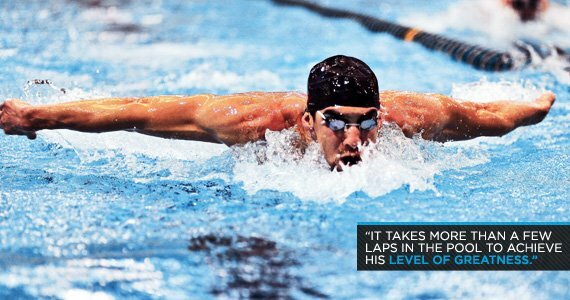 But Phelps needs the huge amount fats and carbs to stay energized through hours of daily swimming and drills. Eating thousands of calories and swimming thousands of meters each week takes a determination and will power that most people can't fathom. One example of his supreme motivation comes from his quest for eight gold medals during the 2008 Beijing games. Phelps's idol and inspiration was legendary Australian swimmer Ian Thorpe. Thorpe is a 5-time Olympic gold medalist, the most of any Australian. When asked about the chances of Phelps going 8-for-8, Thorpe initially claimed it was "highly unlikely." To serve as a constant reminder of the doubt from his hero, Phelps taped the quote to the front of his locker. He saw it before every training session, and used it as fuel to prove Thorpe wrong. Thorpe sat in the stands on the final event of Phelps's golden journey: the men's 4x100 meter medley. After the finish, when the American contingent made history, Thorpe congratulated both Michael and his mother, saying: "Never in my life have I been so happy to be proven wrong." Phelps's relationship with the media has been, er, colorful. Despite some bad press during his greener years, he wants to make sure that his legend as a swimmer is not tainted with performance-enhancing drugs. He has taken part in the U.S. Anti-Doping Agency's "Project Believe" program. As a part of the program, he is regularly tested to ensure he isn't taking anything that is banned by the Agency or the International Olympic Committee. Phelps does a lot to promote his public image. His prestige as an Olympian is further buoyed by his work as a promoter of fitness. He received a $1 million bonus from Speedo and used the money to start the Michael Phelps Foundation. The foundation serves to advance the sport of swimming and support those who wish to live a healthier lifestyle. His foundation may provide a child the opportunity to pursue his or her own Olympic dream, and perhaps break some of Michael's records. To learn more about the Michael Phelps Foundation go to www.michaelphelps.com.